Bedford B headed to Luton for their last away game of the season looking to avenge their defeat earlier in the season. It turned out to be an absorbing night with three of the matches in the balance. Qais opened the scoring for the away team with a pretty routine win on board 5. He first took control of the centre, leaving his opponent very restricted, then opened up the b file and built up a lot of pressure and finally created an unstoppable passed a pawn to notch up victory. The least said about my effort on board 2 the better. After getting in a mess out of the opening I had managed to stabilise things. Then, as is often the way, the moment you relax and think the danger has passed you make a horrible move, which in my case lost a piece and sadly the game. The other games were much more competitive. On board 1 Marc had an intriguing game with Andrew Perkins. Marc’s position looked solid throughout and once queens were exchanged looked to have a reasonable chance of holding the king and pawn ending. 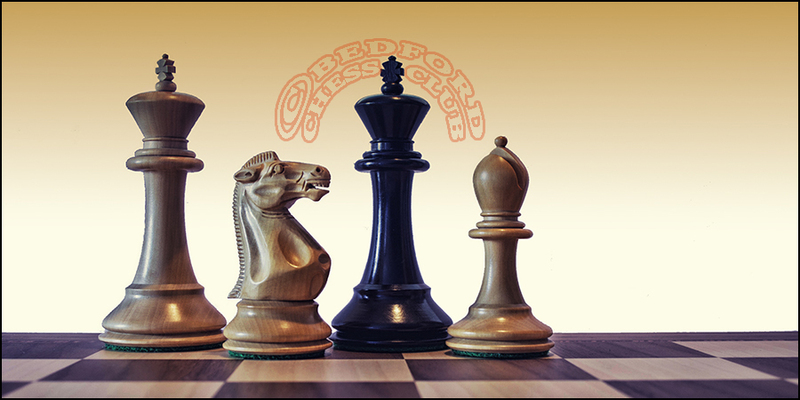 However, one slight mistake allowed Andrew to break up Marc’s queenside pawns which was going to allow his king to gobble up the pawns so Marc resigned. A pity, because the game was probably drawn with best play. On Board 3 Richard (white) and Michael were having a real ding dong battle with the advantage swinging one way and then the other. In the middle game Michael seemed to have the advantage with a pawn thrust to d3 looking like it was going to be decisive. However, somehow Michael got his knight to b1 and it looked misplaced and Richard was able to generate some mating threats against the black king. At the end a nice finish allowed Richard to force his b pawn through (saving him the unenviable possibility of winning a bishop and knight v king ending!) – see game below.